Cuban President Fidel Castro speaks in front of pictures of five men convicted of spying in the United States in Havana, June 23, 2001 (Photo: AFP). It's 2002 in Cuba, otherwise known as "The Year of the Heroes Held Prisoner by the Empire." That is, at least, according to the free wall calendar that came with the Jan. 1 edition of the Cuban government's daily newspaper Granma. Not since the demonstrations it organized on behalf of young shipwreck survivor Elián González has the Cuban government embarked on such a highly choreographed, energetic public opinion campaign. "The Five Patriotic Heroes," as the Cuban press refers to them, are a group of Cuban agents recently convicted in the United States for spearheading a spy ring known as "The Wasp Network." Their six-month trial in a Miami federal courtroom resulted in prison sentences that many Cubans feel were unjustified and excessively severe. Three of the five agents—Gerardo Hernández, Ramón Labañino, and Antonio Guerrero—were sentenced to life in prison; two others, Fernando González and René González [no relation], received 19 and 15 years, respectively. The five Cuban agents were allegedly sent in the mid-1990s to infiltrate U.S.-based Cuban exile groups. By pretending to be staunchly anti-Castro, the agents gained entry into organizations like Brothers to the Rescue and the Cuban-American National Foundation with the intention of gathering intelligence about possible terrorist attacks against Cuba. The prosecution claimed that the agents also unsuccessfully sought to obtain information about a Navy base in the Florida Keys. They were ultimately convicted on charges of espionage conspiracy and operating as unregistered foreign agents. U.S. District Judge Joan Lenard sentenced each of the spies based on the extent of their involvement. 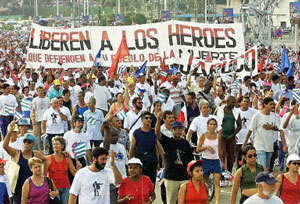 Havana residents demonstrate in support of the detained Cuban agents in December, 2001 (Photo: AFP). "Maybe if they were from another country they would have just been deported," said Gustavo Reynoso, a 45-year-old produce vendor, "But not in this case, not with Cuba." Cuban officials have attacked the trial's legitimacy all along. Just after the trial's conclusion, Cuba's National Assembly met in a special session on Dec. 29 to honor the convicted agents. "The political battle has just begun," announced President Fidel Castro at the meeting, before reiterating a promise he's made publicly since the trials began: "They will return." The Assembly unanimously voted to designate the five as "heroes of the Cuban Republic," and declared that the year 2002 would be dedicated to their plight. The spies' trial has been mirrored by months of fervid "free the five" rallies and an abundance of rousing news reports on government-owned television casting the convicted agents as chivalrous, self-sacrificing crusaders who had ventured "into the belly of the beast" to protect their country. Transcripts of the agents' dramatic courtroom speeches have appeared in Cuban newspapers and have been read aloud on Cuban TV repeatedly. "What else could Cuba have done to defend itself against terrorist attacks? What else could it have done to avoid a greater conflict? What other options were there to protect its sovereignty and the security of its people?" Antonio Guerrero, one of the convicted spies, asked rhetorically in his closing statement. Guerrero, 43, is a U.S. citizen who was born in Miami. Perhaps the most politically charged aspect of the trial was the conviction of the network's supposed ringleader, Gerardo Hernández, on charges of conspiracy to murder. 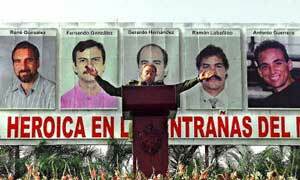 The court found that Hernández played a role in the 1997 downing of two Brothers to the Rescue planes by the Cuban Air Force, in which four people died. Cuba insists that the planes were shot down after repeatedly making unauthorized incursions into Cuban airspace, and that both the Cuban and U.S. governments had reprimanded the pilots repeatedly for dropping anti-Castro leaflets over Havana during the preceding weeks. According to the prosecution, Hernández knew of the Cuban Air Force's plans to attack the planes, as evidenced in his warning to other Brothers pilots not to fly that day. "Four lives were unlawfully extinguished due to the conspiracy the defendant joined, and the value of those lives must be affirmed in the sanction applied to him . . . the prescribed life sentence," wrote federal prosecutor Caroline Miller in the court filings. Hernandez admitted to informing Cuban authorities of Brothers flight plans, but denied any knowledge of plans to shoot down the planes. He received two concurrent life sentences. Many Cubans on the streets of Havana, however, were quick to defend the agents' deeds. "They went to protect the Cuban people against terrorism, and the American people as well. It has nothing to do with politics," said Elsa Alvarez, a 48-year-old florist. But whether one stands north or south of Florida Straits, the trial of the five Cuban agents raises a number of important questions about the United States' relationship with anti-Castro militants, particularly in light of the new war on terrorism. The convicted Cuban spies frequently charged U.S. officials with continuing to distinguish between "good terrorists"—who support U.S. policies—and "bad terrorists"—who don't. For years Cuba has accused U.S. authorities of turning a blind eye to the activities of violent anti-Castro exiles like Orlando Bosch and Luis Posada Carriles. Cuban officials accuse Bosch and Posada Carriles of masterminding, among other things, the 1976 bombing of a Cubana Airlines flight that killed 73 people. Bosch was first arrested in 1968 after he tried to attack a Cuba-bound Polish tanker with a bazooka. Posada Carriles is currently held in a Panamanian jail on charges of plotting to assassinate Castro at the 1999 PanAmerican summit. Havana claims both men have long-standing ties to both Cuban exile organizations and U.S. government officials. When asked his opinion of the charges leveled against the Cuban agents, 65-year-old Roberto Pérez seems suddenly energized in the late afternoon heat. "Lying bastards!" he shouts in disgust, waving his arms in the air. The other old men seated around him on the ledge of an empty Havana supermarket simply nod their heads in agreement.